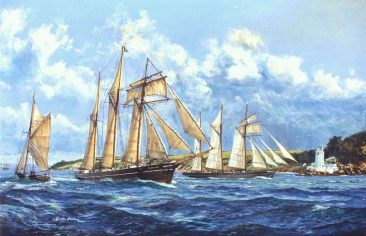 Commissioned by a descendant of the families who built the three vessels illustrated, now owned by his son. Click on an image to see and enjoy more detail. This painting “A dispute settled“. Commissioned by a descendant of the families involved has now passed to the gentleman’s son and is likely, we hope not for many years yet, to pass to his grandson. Its highly original composition was carefully researched including from family archives. “ Rhoda Mary ” and “ Katie Cluett ” were considered the “ Cutty Sark ” and “ Thermopylae ” of the coast trade, crack ships & very smart. The little sloop “Mary” was another family built vessel designed to work locally, completes our composition; Mary was also noted for her speed. Would you like to commission a similar painting?